Number of the week: What you can see from space during a year? 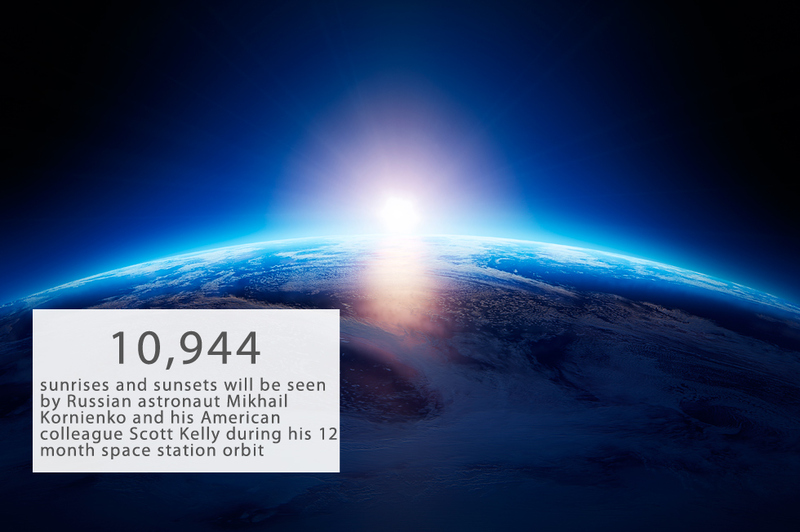 10,944 sunrises and sunsets will be seen by Russian astronaut Mikhail Kornienko and his American colleague Scott Kelly during his 12 month space station orbit, reports NASA.That's 16 times more than can be seen during a year from Earth, where only 684 are visible.Each will spend 700 hours working out and run a total of nearly 650 miles during their time in spaceKornienko and Kelly have already been in orbit for more than six months. Their mission started in March 2015.Photo by Shutterstock. 10,944 sunrises and sunsets will be seen by Russian astronaut Mikhail Kornienko and his American colleague Scott Kelly during his 12 month space station orbit, reports NASA. That's 16 times more than can be seen during a year from Earth, where only 684 are visible. Kornienko and Kelly have already been in orbit for more than six months. Their mission started in March 2015.